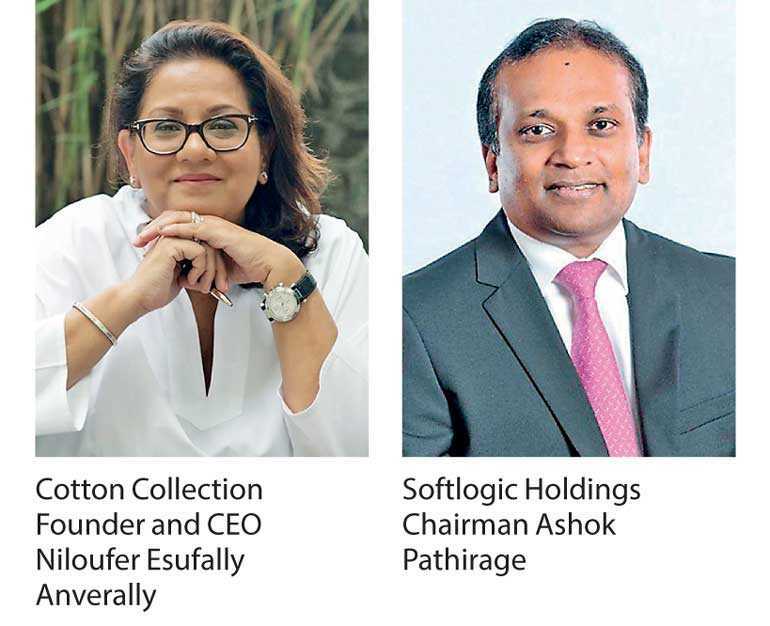 Marking a momentous milestone in Sri Lankan fashion retail, Cotton Collection Ltd. yesterday announced in a statement it has divested for an undisclosed amount its shares to ODEL Plc, a subsidiary of Softlogic Holdings Plc. The much sought-after brand was bought by the Softlogic Group as it was the perfect fit for its well-established, diverse retail network and accelerated expansion plan. Niloufer Esufally Anverally, the founder and creator of the all-Sri Lankan brand Cotton Collection, maintains ownership of her alternate brand Leather Collection. Having identified the core strengths of the two companies, the Softlogic Group believes that the acquisition will garner greater market share for the group. The retail arm of the Softlogic Group has a very strong footprint in the retail sector spanning the verticals of fashion, consumer electronics and furniture. ODEL Plc, together with a strong line-up of standalone flagship branded apparel stores, makes Softlogic the foremost choice for fashion and lifestyle retail in the country. Cotton Collection will be a worthy addition to this already strong and growing base. “The Softlogic Group, founded and led by its dynamic Chairman Ashok Pathirage, are leaders in the field of retail with a strong and proven record and it gives me great pleasure to pass on the reins of my company to them, secure in the knowledge that they will develop the brand further and take it to even greater heights,” Anverally added. “With ODEL, our string of international branded apparel stores and Cotton Collection, we are confident that we can offer an unparalleled array of fashion choices to the discerning and fashion conscious consumer. Fashion and the interest therein, is only growing,” he said. “With increased tourism, urbanisation, a growing middle income bracket and the soon-to-be-opened upcoming malls, namely the CCC Mall which will open in September of this year, The Shangri-La Mall which is planned for opening mid-2019 and the 645,000 square foot ODEL Mall which is slated for opening in 2020, all of which will open out more retail space to the market and tremendously upgrade the retail shopping and lifestyle experience of the consumer, we feel we are well positioned as a Group to tap into the immense growth potential that retail will offer and thereby further consolidate our presence in this segment,” Pathirage added. Capital Alliance Partners Ltd. (CAL) functioned as the financial advisor to Anverally on the transaction which will herald a new age for Sri Lankan fashion retail. Cotton Collection was founded by Anverally in 1991, at a time when fashion retail in Sri Lanka was at a nascent stage. The company today boasts over 15,000 square feet spread across five branches. The 200-strong workforce of Cotton Collection comprises a home-bred design team that curates bohemian, free-spirited collections that have carved out a niche market share over the years. The iconic brand placed on record an exponential YoY growth of 20% in financial year 2017/18. Softlogic Holdings Plc is one of Sri Lanka’s foremost, dynamic conglomerates, with leading market positions in the country’s growing economic sectors: retail, healthcare, financial services, ICT, automobiles and leisure. Softlogic holds authorised distributorships for key global brands and today employs over 9,000 people in its offices located in Sri Lanka and Australia. ODEL Plcis a subsidiary of Softlogic Holdings Plcand has since its inception in 1989 grown to become a household name inthe apparel and accessories market, attracting a constant and loyal footfall of both local and foreign customers. With its flagship store located in the heart of Colombo at Alexandra Place, ODEL has 22 lifestyle stores together with its homegrown LuvSL Brand stores, situated in commercial and strategic locations across the country. In July 2010, ODEL became the first ever fashion retailer in the country to go public, with an Initial PublicOffering that was oversubscribed by 63 times. This venture is just another step in the development of ODEL as one of the largest fashion retailers in the country that caters to the niche market segment in Sri Lanka.